Time for a quick (if somewhat reductive) summary of the tourbillon: originally intended to improve the accuracy of 19th century pocket watches, this horological anachronism is nowadays one of the most coveted gizmos in wristwatches. Often considered the purest expression of a brand’s watchmaking virtuosity, it’s no surprise that various firms have dedicated themselves to making increasingly complicated and delicate versions of the gravity correcting device. 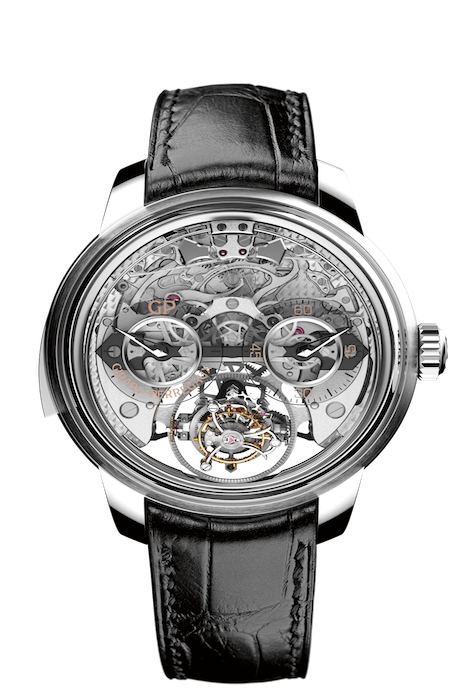 Among a litany of names specialising in high-end tourbillons, Girard-Perregaux still turns heads. At SIHH 2018, the inventors of the distinctive “Tourbillon with three gold bridges” (arguably the most iconic tourbillon ever made) celebrated their 227th anniversary, releasing a number of models which spotlight their mastery over everyone’s favourite mechanical feature. The Minute Repeater Tri-Axial Troubillon features material elements designed to enhance audibility. Among the highlights was the Minute Repeater Tri-Axial Tourbillon. For this more audio sensory take, the design team at Girard-Perregaux relocated the hammer and gongs dial-side; and fused the watch mainplate and titanium casing together for maximum audibility. The sapphire crystal used in both the caseback and dial is concave, so as to further enhance acoustics whilst guaranteeing good visibility. The Minute Repeater Tri-Axial is powered by a manual movement that is water resistant to a depth of 30 metres. The entirety of the Laureato Flying Tourbillon’s rose gold profile really comes together when offset by the skeletonise movement. 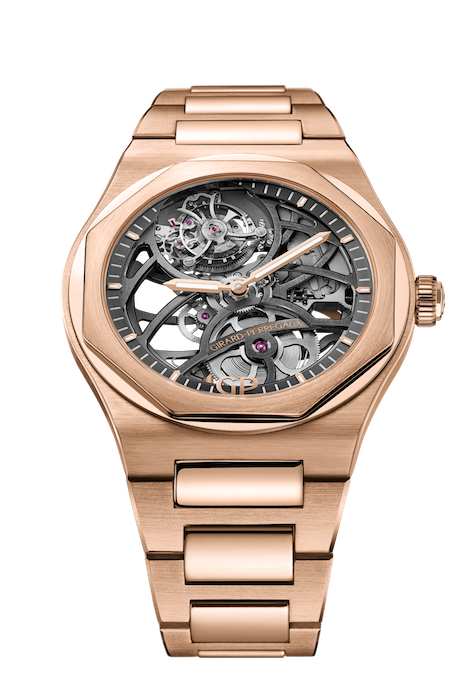 Although tourbillons remain the primary focus at Girard-Perregaux, the manufacture was eager to showcase its high standard of finishing with the release of the Laureato Flying Tourbillon Skeleton. The Laureato is notable for its open worked movement: with the mainplate and bridges decorated using skeletonisation. To enhance wearers’ visibility of other mechanical elements (notably, the gear train and flying tourbillon from which this model derives its name) the dial has even been executed with a partial chapter ring — legibility of the time is preserved through the strategic deployment of gold hour markers. The Laureato is powered by an automatic calibre which oscillates at a frequency of 3Hz; and is available in two variations. Both models feature a very contemporary 42mm case in either pink or white gold. The Neo-Tourbillon Three Bridges Skeleton combines modern aesthetics with a traditional watchmaking sensibility. 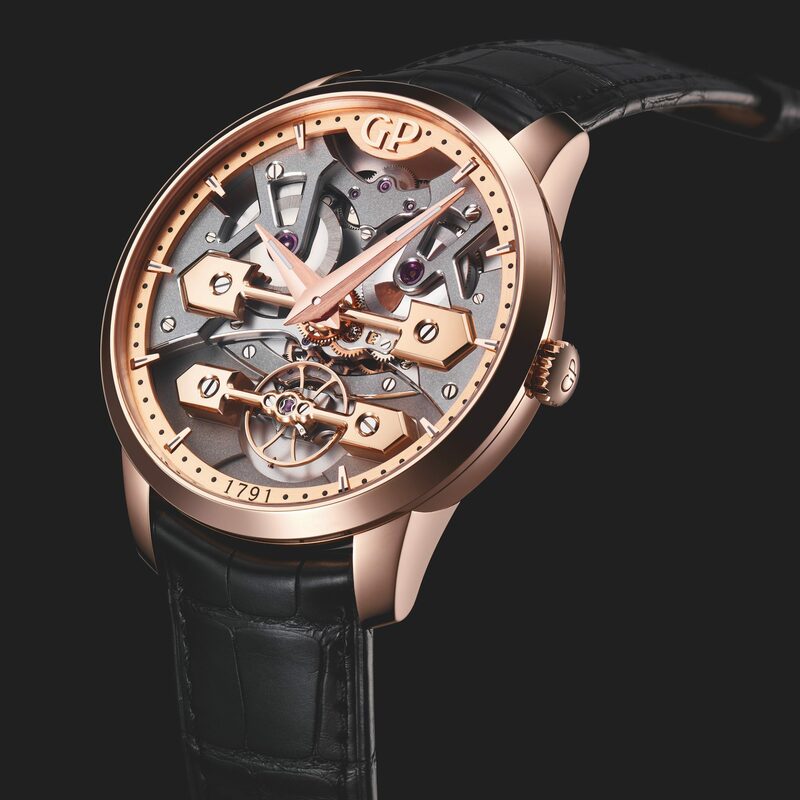 Thirdly, to celebrate its 227th anniversary, Girard-Perregaux pay homage to their acclaimed three bridge tourbillon with the Neo-Tourbillon with Three Bridges Skeleton. 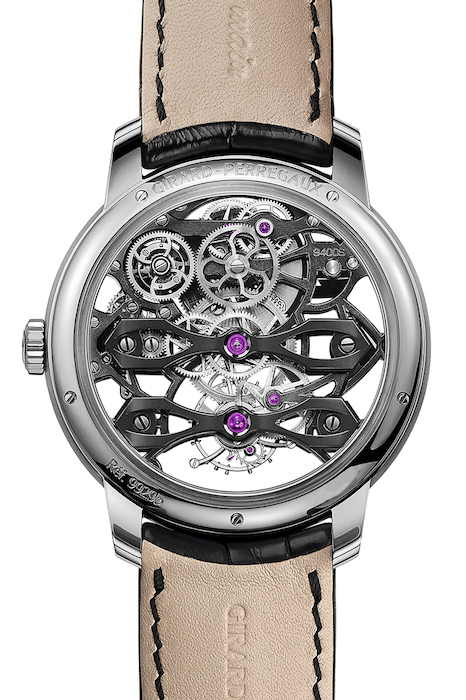 Building on a model released in 2014, the Three Bridges Skeleton combines the modernity of skeletonised movements with Girard-Perregaux’s more traditional watchmaking sensibility. The brand has swapped their instantly recognisable golden bridges for variations made in brushed titanium. Along with other components, the bridges form part of an open worked design that enables wearers to catch glimpses at the watch’s 18k white gold rotor. For more information on local retailers of Girard-Perregaux, visit the brand’s website.